If you’re looking for an affordable alternative to a light-commercial spin bike, the JOROTO GS60 is definitely worth having a look at. It’s one of the newer bikes released by JOROTO in the second part of 2018. Although it’s not a bike made for commercial use, it has a sturdy construction and can support most spin workouts. It also includes several accessories which other spin bikes do not have. The JOROTO GS60 features quite a different frame design than most indoor cycling bikes. It’s not a triangle frame, nor a V-frame; its longitudinal base section is actually composed of two bars which hug the flywheel at the front, while the seat tube and the handlebar tube are directly connected by the main bar of the frame. This being said, there is no step-up bar element above the crank, such as for the Sunny SF-B1805, or the Spinner P3. The bike’s frame is made of ovalized steel tubing, coated with a durable black paint which is resistant to corrosion. The seat and handlebar posts have a chrome plating finish, though, as well as the flywheel. Also, the bike’s construction incorporates a few ABS parts. The side shrouds that cover the belt, the magnetic brake assembly, and partially the flywheel, are made of a durable ABS plastic material. 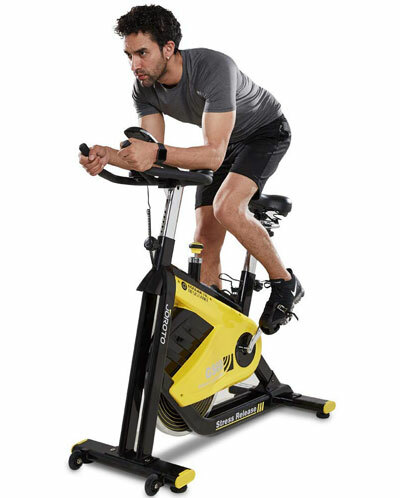 This JOROTO exercise bike isn’t extremely heavy, compared to other spin bikes; for example, the Body-Solid ESB250 weighs approx. 145 lbs (~66 kg). However, its net weight still is ~90 lbs (~41 kg), which is more than twice the weight of the average mountain bike. This being said, the unit provides an excellent stability. Plus, both its bases have adjustable stabilizers, which allow you to perfectly level it on any type of floor. Transporting the bike once it was assembled isn’t too difficult, though. 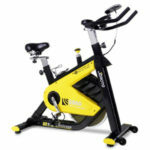 Just like many other indoor cycling trainers, its front base is equipped with transport wheels. By pressing the handlebars forward and using these wheels to move the bike, you will only be handling approx. 1/3 of its total weight. The fully assembled bike isn’t extremely large. It is 49″ (124 cm) long, and 20″ (51 cm) wide. However, it’s recommended to leave at least two feet of clearance all around it for ease of access and safe operation. The JOROTO GS60 includes a high-comfort saddle. It’s approx. 10.8″ (27.5 cm) long, and 7.9″ (20 cm) wide. It integrates a thick layer of foam cushioning especially in its rear section. Its rear part features two suspension springs which add more shock absorption. It also has a longitudinal groove in order to provide a higher breathability during seated workouts. Although it’s a really comfortable seat for an indoor cycling bike and you may not need to replace it, finding a replacement for it shouldn’t be a problem. Its attachment system to the slider is standard. Therefore, compatible options for it should be available in any bike shop. The seat is four-way adjustable (up, down, forward, backward). Its designed to suit users with an inseam between 27.5″ to 35.4″ (70 – 90 cm). 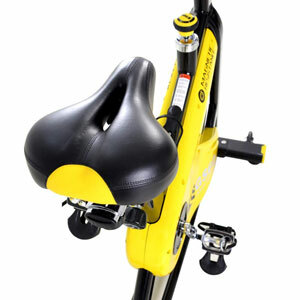 Differently put, the bike can accommodate users between 5’0″ and 6’4″ (153 – 193 cm) with no problem, promoting a correct leg extension during pedaling. Also, the seat assembly is durable enough to support users up to 280 lbs (127 kg). 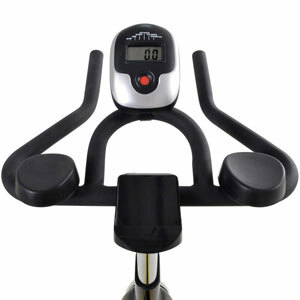 This JOROTO exercise bike is equipped with a multi-grip handlebar. It can provide at least four grips, including standard, parallel, aero, and race. It has a center loop aerobar to which the meter is attached. It is urethane dipped in order to provide a comfortable and secure grip. Two elbow rest pads are included with the bike. Not many exercise bikes come with these accessories. A phone holder is also attached at the top of the handlebar post. Finally, the bike’s handlebar is two-way adjustable. Its upright post provides approx. 5″ (13 cm) of upright adjustment. It does not have a horizontal slider, and cannot be moved forward and backward as the seat. The JOROTO GS60 is equipped with a mid-range, 30 lbs (13.6 kg), chrome-plated flywheel. It has a perimeter-weighted structure in order to provide a high inertia, great for spinning workouts. The pedaling motion is very smooth and pedaling in reverse is also possible. However, when pedaling in reverse, the resistance remains constant. This being said, you cannot coast on the bike. The crankset is highly durable, designed to support any spin workout. Therefore, even if you’re close to the maximum 280 lbs (127 kg) weight limit, you should be able to pedal while standing up with no problem. The crank arms are steel-made, and the pedals are made of a metallic alloy as well. The pedals feature adjustable toe cages but do not have clips for spin shoes. Their threads are 9/16″ standard, though, so you can replace them with almost any type of bike pedals if you want. The JOROTO GS60 features a manual magnetic resistance system. It is equipped with a magnetic brake pad which is attached to the tension knob on top of the main bar of the frame. When you turn the knob clockwise, the magnetic brake moves closer to the metallic flywheel increasing the magnet’s pull. This results in a higher pedaling difficulty. Since the resistance system doesn’t involve any friction, the usage of the bike is almost completely silent. The tension knob also fulfills the function of an emergency brake, though. You can press it down to instantly stop the flywheel. This is actually recommended, especially when pedaling at a higher speed, due to the fact that the flywheel is pretty heavy, and the pedals continue to spin for as long as the flywheel is spinning. There aren’t any pre-determined resistance levels marked on the bike’s tension knob. But as a general idea, by tightening it all the way, the resistance generated will provide a very consistent workout. The bike’s internal transmission uses a poly-v belt. Just like any bike belt drive, it doesn’t require lubrication. 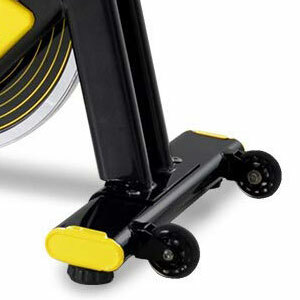 It also generates less vibration than a chain, the pedaling motion being very smooth and quiet. The bike’s exercise meter is a basic unit, but considering that many other spin bikes (even commercial ones) do not have this accessory, having it is quite a plus. Its LCD display shows time, distance, total distance, speed, and calories burned. It does not have a pulse reading function, and the bike does not have any integrated pulse sensors. 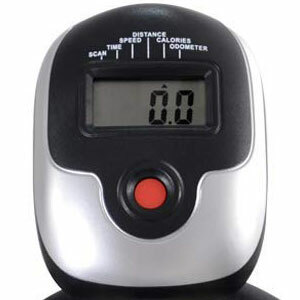 Therefore, if you need to keep an eye on your heart rate during your workouts, you will have to use a separate device. The meter unit only has one button and is powered by two AAA batteries. It starts up when you press the button or when you begin pedaling, and also has a sleep mode to which will enter after a few minutes of inactivity on the bike. By pressing the button repeatedly you can select one of the values to be shown all the time on the display. You can also select its Scan function and with it set ON, all the values will rotate, each one appearing on the display for a few seconds. The unit’s button can also serve as a reset button. You can press it and hold it for a few seconds to clear all the values on the meter to zero. The core frame of the bike comes pre-assembled. The resistance elements, the flywheel, the crankset, the belt, and their covers are already in their places. Therefore, you only need to attach the two base stabilizers, the seat post, the saddle, the handlebar post, the handlebar, the pedals, the meter, and several other small parts. This shouldn’t take more than 40-50 minutes. All the tools needed for it are included, and the manual provides very clear assembly instructions. For maintenance, you only need to wipe off the sweat that may have fallen onto the frame during your workout, and periodically look for loose bolts and parts. The belt doesn’t need periodic lubrication, and since the brake is magnetic, should not undergo any wear and tear, at least not for a very long period of time. No LED backlight on the exercise meter. 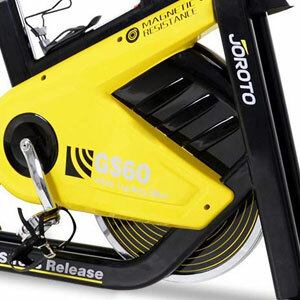 The JOROTO GS60 is an indoor cycling bike made for spin workouts. It’s equipped with a magnetic resistance system, a 30-lb flywheel, and a high-comfort seat. It offers superior micro-adjustability and has pretty sturdy construction for a home use trainer (can support users up to 280 lbs). It’s a great bike for high-intensity cardio workouts, interval training, stamina and strength development, and of course, for burning a lot of calories. And finally, it costs less than half the price of a commercial-grade spin bike, while its overall quality is pretty close to light-commercial.